“The chief function of the disciplinary power is to ‘train’… It ‘trains’ the moving, confused, useless multitudes of bodies and forces them into a multiplicity of individual elements – small, separate cells … combinatory segments. Our need to have this discussion comes on the heels of a number of people who were taken before the Departmental Review Board (DRB) here at California State Prison-Corcoran SHU (Security Housing Unit) on Nov. 12, 13 and 14, 2013, pursuant to the new SDP (Step Down Program) pilot program. Comrade Zaharibu Dorrough also attended the DRB on Nov. 13, 2013, and was placed in Step 2 of the SDP with an understanding that, if accepted and completed, Zah would be transferred to Tehachapi SHU and placed in Step 3, where, according to Section 3334 (k) (Page 153), contact visits are allowed. But since implicit in making it a requirement that people participate in those programs available in each step and that any failure to do so will result in a person being moved back to Step 1 until that person agrees to subordinate him/herself to the dictates of Section 700.2, the cognitive restructuring/brainwashing program is, clearly, mandatory. It has also been established that a facility has been opened at Pelican Bay in Del Norte County for those prisoners who have medical and mental health problems. If prisoners choose not to participate in the Step Down Program or any aspect of it, retaliation follows, ranging from a person being put back in Step 1 to a person being transferred to Pelican Bay. There is absolutely nothing at all that distinguishes the DRB and STG (Security Threat Group) Committee from any other committee. And while the new policies will result in some prisoners being released to general population, these new policies do not represent a pathway to general population or even a less restrictive housing environment, as the CDCR is quick to claim for certain prisoners. Specifically though, it is the CDCR’s attempt to brainwash us all through their behavior modification program. And that is exactly what the cognitive restructuring program is.We have had the opportunity to see and read the self-directed journals. They are insidious. The NCTT-Cor-SHU (New Afrikan Revolutionary Nationalism (NARN) Collective Think Tank Corcoran SHU) has articulated in previous statements** how the self-directed journals, their themes, and the additional “integrated, cognitive behavior change program” are a systematic and progressive brainwashing initiative designed to emulate in those subjected to it the same personality restructuring as the debriefing process – i.e., character invalidation, Skinnerian operant conditioning (learned helplessness) etc. – introduction of state-approved new attitudes through “thought reformation,” criminalization of cultural mores, disorganization of group standards, prohibition of group activities not consistent with brainwashing objectives, encounter group sensitivity sessions, Synanon Attack Therapy etc. It is our assessment that politically mature and ideologically advanced men and women could be subjected to such brainwashing techniques and suffer no deleterious effects, save the insult towards one’s dignity that the state would dare attempt to use such transparent and futile techniques against us. However, that is not the case for younger and/or less developed prisoners. Many of these young men and women may view the themes of some of these journals and have no experiential basis from which to even understand their meaning, let alone the processes attendant to them, thus leaving them all vulnerable to these brainwashing techniques. In order to successfully complete this aspect of the Step Down Program, you must be willing to accept and believe all of the absolute worst things that the state has said about us all and continues to say – and invalidate yourself completely. Prison is not conducive to the maturation process, and the less developed we are, the easier it is, even in the face of resistance, for us to be turned into whatever the state wants us to be. That is why study is so very important. Taking certain people before the DRB and placing them in certain steps is an effort by the CDCR to try and exploit the perception of influence of principled people and to try and legitimize the Step Down Program itself and the brainwashing components thereof. It is the CDCR’s hope that they will be able to use as leverage the decades of sensory deprivation confinement of many of us. The prospect of our having access to our families and loved ones will persuade us to comply, and they will use what they perceive as our influence to herd untold numbers of underdeveloped and impressionable men and women into a process we know full well will result in them being transformed into broken people, a submissive and subservient population of prisoners who will make the misappropriation of tax dollars a more orderly enterprise. There is no set of circumstances in which any principled person would agree to aid the state in carrying out such an insidious, vile and patently evil process. In spite of this, and it should come as no surprise, Dr. Samenow is popular within law enforcement, corrections and the political establishment. The American Community Corrections Institute or ACCI, for instance, uses cognitive restructuring. There is no marked difference between asking us to endorse – via our participation – a state-sponsored brainwashing program like this and asking us to convince the women in Valley State, CIW and CCWF prisons to submit to sterilization! That we are having a conversation about behavior modification, forced female sterilization and human experimentation in the modern California Department of Corrections should arouse this entire nation to arms against such structural fascism in its midst. Despite the historic and heroic efforts of numerous activists and principled journalists across this state, nation and globe in raising public awareness of U.S. domestic torture units in supermax prisons across America, this particular issue, the active pursuit of brainwashing prisoners against their will, and now the revelation that hundreds of women were sterilized by the state – on American soil or anywhere else on this planet for that matter – has simply not garnered the degree of public discourse that it warrants. Consider for a moment: The Center for Investigative Reporting (CIR) and Justice Now found that the CDCR conducted 116 illegal sterilizations for purposes of “birth control” during caesarian section without the consent of their victims, though this is prohibited under federal, state and common law. This was not only common practice in CDCR facilities for women but, like mass incarceration itself, medical staff disproportionately targeted New Afrikan (Black) and Latino women. With this in mind, this same agency seeks to instruct and alter the values, moral compasses and thought processes of prisoners via thematic journals with themes such as “Social values,” “Thinking errors” and “Values” – the latter which proposes to “guide inmates through an evaluation of the criminal values that have influenced their lives and help them weigh the consequences of living a life based on criminal values versus responsible values”! The sheer mengalesque authoritarian hypocrisy of this department is breathtakingly horrifying. The CDCR is presiding over the largest domestic torture program in the U.S. engaged in forced sterilization and advocating the mandatory brainwashing of scores of SHU prisoners – and they want to instruct us in “social values,” “thinking errors” and what is and is not “criminal”? Seriously?! Where is the Legislature, the Congress, Department of Justice while this resurgence of Nazi-era pseudo-science is being codified into CDCR policy with taxpayer funding? Where is the Sacramento Bee, CBS, Oakland Tribune, NBC, LA Times, ABC, San Diego Union Tribune, Fox News or the Associated Press while horrors prohibited by the Nuremberg Code are given new life in contemporary penal best practices? Has this society truly decayed so thoroughly that our culture, our communities – all of us: free and bond, rich and poor, all cultures and religions – will tolerate public officials engaging in such repugnant assaults on the very fabric of humanity without the most vocal and vigorous organized outrage?! What must be understood is that these are not assaults on prisoners but on the very nature of human civilization. We ask you all, have we truly sunk so low into the quagmire of individualistic pursuits and sidewalk escapism indicative of the capitalist arrangement that we cannot even be roused to mass resistance against state-sponsored torture, sterilization and brainwashing? The NCTT, indeed all of us simply refuse to believe this. The past two and a half years in particular give credence to the dynamic influence of people power and its transformative potential. If the CDCR were genuinely sincere that the SDP is a legitimate path out of the torture unit for prisoners – as opposed to another venue to break men’s and women’s minds, Section 700.2 of the STG Pilot Program would be discretionary, not mandatory. Under such circumstances, perhaps, prisoners confined to these torture units might be amenable to at least giving the program a try. Unfortunately, that’s simply not their position. And that is the best proof of the program’s actual intent. We should all consider that while to some, including some of us in prison, these may simply be compelling words on paper, in truth this really is about human lives and minds – some of who will, consciously or unconsciously, spread these techniques to those communities that they will go back to. This alone should move us all to action. Long live the spirit of the beloved Herman Wallace – love and with you always. There should be no doubt indefinite solitary confinement is torture. Yet in §700.2, the CDCR has devised an insidious program whereby they can leverage this torture to coerce validated SHU prisoners to submit to brainwashing in lieu of debriefing; the end result being qualitatively no different: the production of a docile, submissive, quasi-informant population who reproduces in themselves the values of the same authoritarian order responsible for mass incarceration and the domestic torture program. In other words, “broken men” will be created by a new process. In §700.2 of the STG Pilot Program, CDCR outlines, beginning in step 3, a requirement that prisoners complete “12 months of journals… that lead to responsible thinking and behavior.” This behavior modification program (and that’s exactly what it is) is preparatory, designed to condition the minds of the targeted population to accept cognitive restructuring. This intent is clear in the themes of the journal. An absurd notion. The overwhelming majority of validated SHU prisoners have committed no criminal act(s) or rules violation(s) (a natural outgrowth of so-called “criminal values”) to be confined to SHU by CDCR’s own admission. Many are in SHU on purely ideological grounds: for holding revolutionary attitudes or socialist values which oppose authoritarian social control and exploitation of the underclass. This begs the question, What are “criminal values” and who defines “responsible values”? Surely it’s “criminal” to hold a population captive under conditions of indefinite torture unless they become informants or submit to having their “values” modified. Are we to assume an entrenched industrial interest that has intentionally manufactured the legislative and physical conditions (in prisons) to perpetuate mass incarceration to establish their own labor aristocracy, while presiding over the largest domestic torture program on the planet, are now going to be the instiller of “responsible values”? The answer is: No, of course not! The Self-Directed (S-D) Journals component of the SDP is replete with other Orwellian themes like “thinking errors,” “social values,” “responsible thinking/healthy personality,” and “peer relationships.” These themes constitute classic “character invalidation,” an essential Schein model brainwashing technique employed to induce guilt, self-loathing, anxiety, irrational fear and suggestibility, while simultaneously providing social and emotional supports which reinforce the new subservience/ docility. This is in fact an improvement on the original Schein behavior modification model outlined in his paper, “Man Against Man: Brainwashing,” the basis for previous SHU best practice. Up to now, torture unit administrators, IGI, and OCS have relied on staff and their specialized SHU training to observe prisoners’ behavior patterns, record them in the “daily activity log” and utilize this data to calculate a prisoner’s sensitivity to pressure, or vulnerability to the same, with a degree of precision. This is one way the IGI is able to anticipate and target specific SHU torture victims who are prepared to—or on the verge of—debriefing. They now intend to use the prisoners themselves to provide additional input data to facilitate and reinforce their own brainwashing. You are not only expected to submit to brainwashing in order to escape indefinite torture, but you must actively participate in your own cognitive restructuring or be trapped indefinitely in thetorture unit’s “steps.” This is “Skinnerian operant conditioning,” the rewarding of submission to the character restructuring encompassing the brainwashing objectives by easing the pressure on the subject in this by moving them along to the next “step.” But in truth, this is no “reward” at all. As previously stated, the S-D Journals are only preparing the subjects’ minds for complete restructuring, while weakening (or removing completely) any psychological resistance to the more intense behavior modification techniques to come. These are introduced in step 4, and as if aware of the pliancy (in this context, easily influenced) and desperation of those prisoners willing to submit to these techniques, the state makes no attempt to conceal their intent. The text states clearly, “Step 4 will include an integrated, cognitive behavior change program that will include cognitive restructuring…” For those of you not familiar with this language, this means brainwashing. The exact nature and composition of the step 4 “cognitive restructuring program” has been intentionally left vague and ambiguous. It is designed for “small groups” of subjects, and will no doubt be a modification of techniques already tested in other SuperMax torture units which include Synanon attack therapy (a form of character invalidation for a group setting), transactional analysis, and encounter group sensitivity sessions. This progressive step-based approach ensures maximum control for therapeutic administrators to prevent subjects having contact with anyone not sympathetic to the reconditioning methodology, disorganizing group standards among prisoners which are not pro-conformist, all within the confines of an environment that is prohibitive/restrictive towards any activities or ideas which are not supportive of the brainwashing objectives. In the end, the conditioned subject is psychologically no different than the debriefer: a broken man/woman. What must be understood is participation in such a system of behavior modification on any level exposes any mind to the prospect of restructuring, primarily because most of these techniques target the subconscious mind. We do not want to get overly technical, but we believe it is important and we will simplify it as briefly as possible with a single example. The conscious mind makes judgments on what is real and correct or illusory and incorrect. But the subconscious mind accepts all information introduced into it as fact. The conscious mind, unfortunately, only functions when you are “conscious” of a thing or are aware; the unconscious mind always functions—it never sleeps. The conscious mind is simply “the computer;” the unconscious mind is “the computer programmer.” If one can bypass or circumvent the conscious mind and go directly to the subconscious, the conscious mind can be made to believe whatever has been introduced into the subconscious. For example, recall our explanation that the self-directed journal models in step 3 require you to complete a theme on “values” which presupposes you function from “criminal values” and need to [acquire] “responsible values.” Your conscious mind, of course, would disagree that your values are “criminal.” However, by participating in this exercise, you expose your mind to contextual adaptation to carry out the exercise (“contextual” referring to a set of circumstances or facts that surround a particular event, situation, etc.). Your subconscious mind will not make any distinction in the validity of the presupposition, only that some of your values may contradict those defined as “responsible” and thus by relational context, must be “criminal.” The thought divergence (separation) will manifest itself subconsciously as “character invalidation,” though you’ll not note this consciously. It will manifest itself in contradictions in your thinking, speech, and conduct too subtle for you to note overtly until the thought divergence progresses. Yes, they are truly insidious. The only sure method of resistance (outside of contra-conditioning techniques) is not to expose yourself to brainwashing therapy in the first place. But some will, and some of those who do will become tools of the state, entering the general population or their communities and reproducing these attitudes in others. From the perspective of the state, if some of these have influence, all the better for the prison industry. It’s the reason these techniques were included as mandatory aspects of the pilot program. Following the hunger strikes, CDCR did not see victimized prisoners united to end their collective torture, but instead an opportunity to transform the most advanced and influential into broken men and creators of the same; an environment where the orderly extraction of taxpayer dollars in proportion to prisoner commodities is inflated by SHU confinement but uninterrupted by pesky concerns like human rights, international law, or the Constitution. That they will fail is not of import—that they are trying this is. Which leads us to the core of the matter. There exists no moral or legal basis for compulsory brainwashing in civilized society. With all of the self-inflicted behavior modification in the capitalist consumer culture from Weight Watchers to anti-smoking products like Nicoderm, US society has become acclimated to being brainwashed, to say nothing of social automation. But camouflaging Dr. Schein’s abhorrent techniques under misleading language that not only conceals its meaning and intent from prisoners, but the public as well, does not make them any less illegal. The very assertion by the state that one’s political ideology and cultural values are “criminal,” or are somehow a legitimate pretext for indefinite solitary confinement torture, violates the First Amendment, just as holding the threat of indefinite SHU torture over a prisoner’s head unless they become an informant violates the Eighth Amendment. But coercing a population into submitting to a brainwashing program that most don’t even understand, and passing it off as a “social good,” is not simply illegal, it’s evil . These provisions laid out in §700.2 not only violate the First and Eighth Amendments, but also the UN Convention Against Torture [original text is not available right now], the UN Standard Minimum Rules forTreatment of Prisoners, and most disturbing of all, the Nuremberg Code. “Voluntary consent of the human subject is absolutely essential. This means that the person involved should have legal capacity to give consent; … able to exercise free power of choice, without the intervention of any element of force, fraud, deceit, duress, overreaching, or other ulterior form of constraint or coercion; and should have sufficient knowledge and comprehension of … the subject matter involved … to make an understanding and enlightened decision….” (In this instance, indeterminate SHUs, indeed SHUs themselves, are torture units). CDCR has made it clear that no one is going to escape these torture units unless they submit to the techniques. Their new mantra is thus, “Parole, debrief, submit to brainwashing, or die.” Most prisoners, and for that matter most citizens in the US, have little to no understanding of the Schein, Levinson, Skinnerian cognitive restructuring model, or its intent. This should outrage us all. Of course, you would have to be brainwashed/broken to believe and subordinate yourself to this. If it was true that snitching does not compromise the informant’s safety, it would not be necessary to separate (known) informants from the non-SNY/PC general population. Once a person debriefs, that person is automatically assigned to SNY [special needs yard]. It has been demonstrated time and time again that the abuse of your tax dollars by the CDCR is based upon the lawlessness of the CDCR. A lawlessness that includes a complete disregard for those of us housed in these madhouses. And in particular for those who would dare oppose the disrespecting of our humanity. The humanity of us all. The Agreement to End Hostilities by the Pelican Bay representatives is a crucial step in our reclaiming our humanity and creating opportunities to put an end to the efforts to destroy us all. We must take advantage of this opportunity to demonstrate to the world that we are willing and capable of being the history makers that this opportunity now provides us all. That the state has actually created a whole new bureaucracy to manage this brainwashing program within an already existing domestic torture program designed to grow under this policy should compel us all to act, as this new bureaucracy will be funded by your tax dollars. Are we as a society going to stand idly by and listen to our politicians stride the world stage criticizing other nations for human rights abuses while this Orwellian, pseudo-scientific torture initiative is carried out in your name within your national borders? We need each other if we are to be free. We can all reclaim our humanity by demanding that the humanity of all be respected. Let us reclaim it together. We extend our heartfelt greetings to you, brothers and sisters. Academics from multiple disciplines, from psychologists to sociologists, have all weighed in with the objective, scientific analysis that indefinite SHU confinement is not only torture, but even limited SHU confinement results in irreparable psychological damage. Yet, as with the Bush era “torture papers,” the socio-economic and political interests of the capitalist tend to supersede and supplant objective evidence, moral reason and human decency. Such debate, which only continues in the presence of arguments contrary to the obvious reality of the U.S. domestic torture program in SHUs across the U.S., is not only ludicrous, it’s reality, and it is this lethal component to the debate which forces us to share a perspective which should end the debate definitively, leaving behind only the inescapable truth: Amerika maintains the largest domestic torture program on earth. The state of California runs the largest torture program in Amerika, and it continues to exist in your name, with your tax dollars, because you allow it to. A recent incident here in Corcoran SHU’s short corridor compels us to give voice to the outrage we should all feel at the continued maintenance of the indeterminate SHU debriefing process of the U.S. domestic torture program: Another suicide, Armando Morales (Baby Paya), a validated Mexican prisoner from Los Angeles who had been confined to SHU for almost a decade, hanged himself after the IGI moved him from the 4B-1L-C-Section short corridor, to 4A-1R. The reason(s) that Armando was moved are the typical ones associated with the coercive tactics employed to break men’s minds: After his girlfriend had been compromised by IGI and other state and federal law enforcement, those same agencies mounted an effort to put pressure on Armando, who was actually a baby in terms of what he did and did not know, as it relates to the enormous pressure that law enforcement will apply to coerce information from persons they’ve targeted. In response to that pressure, he took his own life. Naturally, IGI and the state will seek to escape any culpability, and their response to this is that each person is responsible for his own conduct. We should all recognize the illegitimacy of such a position – that this is nothing more than an excuse to try and separate themselves from a situation that they are responsible for by their reckless and barbaric disregard for our humanity. Amerika maintains the largest domestic torture program on earth. The state of California runs the largest torture program in Amerika. We know this primarily because the vast majority of us have been in these tortuous madhouses for decades. One day is too long and not a single illegal act or rules violation has been committed by us to justify this, which is, by international law, unjustifiable. This last technique is a key factor of both validation based indeterminate SHU confinement and the debriefing process. “Learned helplessness” is a systematic process of conditioning to crystalize in the imprisoned victim’s mind that he has no control over the regulation of his existence, that he is completely dependent on the state and its guards for the necessities of “life,” that he is helpless and must submit to the state’s power and control. Our research into the origins of the torture program reveals that this type of systematic psychological degradation to coerce information and create broken men is its purpose. This is, of course, contrary to core human consciousness and a linear thought divergence into two options, “resistance or escape.” The program is designed to apply maximum punitive coercion against “resistance” from the outset – from physical removal from the general (prison) population to sensory deprivation, using informants, collaborators and agent provocateurs to erode trust amongst those of like circumstances, punishing uncooperative attitudes, prohibiting collective thought or expression while simultaneously employing group punishment, arbitrary punishment and property restrictions etc. At the same time, those who are capable of prolonged or indefinite resistance through ideological consistency, political development or force of will – like victims of crucifixion left to rot on crosses during the Roman Empire – they serve as powerful deterrents to those of lesser psychological resilience or those in general population to not resist and instead explore the second option: escape. The state of California has made its escape option clear since taking the Schein-Skinnerian-Levinson system to its heights in erecting the torture units at Pelican Bay SHU. There are only three escape options available to you: parole, debrief or die. Due to the successful corporate influences of the prison industrial complex on the legislative, political and, to a degree, cultural processes in the nation over the past quarter century, most validated SHU prisoners are serving mandatory minimum, enhanced or BPT (Board of Prison Terms) based sentences and their very confinement to SHU is prohibitive to their parole. This reinforces the psychological pressure on those already weakened by the enforced conviction that they have been abandoned by and isolated from society – and only through submission and subserviency can they be socially accepted as human beings. This form of “escape” – debriefing – is consistent with points 7, 8 and 9 of Dr. Schein’s behavior modification techniques: (7) exploitation of opportunities and informers; (8) convincing prisoners they can trust no one; (9) treating those who are willing to collaborate in far more lenient ways than those who are not. Again, our personal experience with the state and its use of such opportunistic broken men against those of us who are committed to resistance has been demonstrated here at Corcoran-SHU on a number of occasions in which agents posing as revolutionary progressives have tried to undermine the efforts of the NCTT (New Afrikan Collective Think Tank), and when those efforts failed, they locked up and debriefed. It was only through our collective education and insight and experience with these periodic Cointelpro-style attacks on progressives which allowed us to identify and resist the attack and mitigate its political disorder. But this does not negate the damage done by the broken males to the unity and progress of resistance in the SHU population. Though political immaturity by some elements played a role in the mistrust and disunity that resulted from it, in the broader population, it is the nature of the domestic torture program itself to create such broken males that we must understand is prohibited by the international community – and the U.S. knows this in analyzing the effects of such broken males on the psychology of certain elements in SHU. Other such examples of torture being put to such use against those who resist in Pelican Bay, here and across the U.S. is legion. In the etiology of the U.S. domestic torture program, Marion Control Unit was the first. When former Marion Warden Ralph Aron was asked why the torture unit was built, he replied, “The purpose of the Marion (and all) controls unit(s) is to control revolutionary attitudes in the prison system and society at large.” These broken males thus serve to not only damage or destroy progressives in prison but the attitudes and ideas of progressives in society at large. It was always meant to be this way. To be sure, Dr. Broder, the psychotherapist who implemented Dr. Schein’s brainwashing program at Marion envisions those paroled broken men as “therapeutic technicians” who will take these techniques and warped views back into the community. Some 30 years later we have a snitch culture that derides objective facts in favor of a corporate media-created fantasy, and it owes some of its existence to the disastrous effects of isolation, which leads to the inevitable final “escape”: Death! Suicide rates in these sensory deprivation torture units are magnitudes higher than those in general population. Speaking these words simply does not convey the reality of what we all know intimately: the transient appeal of the void as an alternative to endless isolation. We all know of the disastrous effects of isolation because we have seen what it does, along with the pressures that the state brings to bear on us all daily in its efforts to break us, efforts that include compelling the taking of one’s own life. If this domestic torture program did not exist, Armando and so many others would still be alive today. But his is only the “escape” view of death. There is also a “resistance”-based view of death – that all of us who will never be counted amongst the broken men not only understand, but have demonstrated twice before, and may well be compelled to do again: peaceful protest in the form of hunger strikes, mass single cell, work stoppage etc. Christian Gomez died [a year ago], not “escaping” these torture units but “resisting” these torture units, and it is this dialectical view of this final option – that death is an active and practiced form of both escape from and resistance to indefinite SHU confinement – is the final and definitive proof that it is, undebatably, torture. During an assembly hearing on solitary confinement on August 24, 2011, a former Corcoran-SHU prisoner testified, “For someone to be willing to lie down and die just for someone to hear the situation … in the SHU program, they must be serious.” His assessment was correct. We are serious. The question is, are we as a society serious about upholding basic tenets of humanity. People are dying who could be saved while you are reading these words. A former Corcoran-SHU prisoner testified, “For someone to be willing to lie down and die just for someone to hear the situation … in the SHU program, they must be serious.” His assessment was correct. We are serious. The question is, are we as a society serious about upholding basic tenets of humanity. And now you know. This is a system that must be abolished. It is a system that has robbed us all of some part of our humanity and has caused us to lose our way as a nation. So many of us have stood idly by as the U.S. has strode the world stage criticizing other nations for systematic human rights abuses and demanding that others meet their obligations to the world community, while they maintain the single largest domestic torture program and the single largest prison population on earth. If the U.S. is going to continue to insist that other nations meet their international obligations under U.N. treaty resolutions, they must do the same and adhere to the U.N. Convention against Torture. They have proven that they will not do so without compulsion. We must ensure that they do so, as a nation of the people, for the people and by the people. If we are doing anything less, we are complicit in the state’s hypocrisy. The Pelican Bay D Short Corridor has given us the proper onus for unity in their historic “agreement to end hostilities” issued for Oct. 10, 2012. We call upon all of you brothers and sisters across the nation in prison yards and hood blocks, in SHUs and barrios: Take up this call also. Turn your attention not toward one another, but to those who have condemned us all to languish at the lowest rungs of this locked anti-poor society: the ruling 1 percent. Many of us have stood idly by as the U.S. has strode the world stage criticizing other nations for systematic human rights abuses and demanding that others meet their obligations to the world community, while they maintain the single largest domestic torture program and the single largest prison population on earth. If the U.S. is going to continue to insist that other nations meet their international obligations under U.N. treaty resolutions, they must do the same and adhere to the U.N. Convention against Torture. Join the movement – embrace, support, join or form your own local Occupy or anti-prison industrial complex formation. Build coalitions. And in doing so, change this world. Come, let us make peace. NCTT stands for NARN (New Afrikan Revolutionary Nationalism) Collective Think Tank. 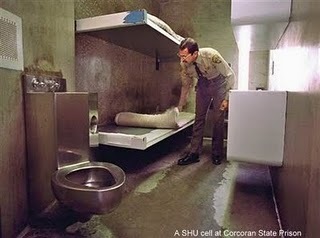 All are held in solitary confinement, an internationally recognized form of torture, in the SHU (Security Housing Unit) at Corcoran State Prison. Please micro-donate to us via Flattr, thank you!